Barely 24 hours after the Taraba State election petition tribunal sitting in Abuja nullified the election of the state governor, Darius Ishaku, violence has erupted in Wukari area of the state. The tribunal had declared the All Progressives Congress (APC) governorship candidate in the April 11 election in the state, Hajiya Aisha Alhassan, winner. Eight persons were reportedly killed, with more than 30 said to be injured when armed men suspected to be Jukun militia attacked residents of Wukari, on Saturday night. Alhaji Tanimu Danlele, a former vice chairman of Wukari Local Government Council, told NAN that, at least, eight people lost their lives and more than 30 others were injured in the crisis. 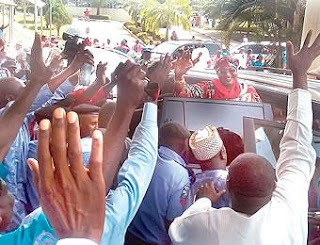 A security source in Wukari told Sahara Reporters that supporters of Governor Ishaku and Senator Alhassan clashed throughout the night until the early hours of Sunday. Residents of the area, it was gathered, were terrified as they heard sporadic gunshots around 1:00a.m., while the attackers invaded quarters in the area, shooting and burning houses. “We were awakened by gunshots in our area and the attackers chanting ‘to hell with tribunal ruling, to hell with Aisha, we will kill you all,” one of the residents said. Reports also had it that the crisis started following celebrations and protests for and against the court ruling, delivered in favour of Aisha Alhassan. A resident of the town who spoke to Premium Times on phone, Kawu Musa, said the crisis broke out after some touts took advantage of the protests to unleash mayhem. He said some residents fled their homes to the bush for safety, adding that gunshots rented the air earlier in the day before the deployment of security agents to restore order. “They just started firing sporadically, chanting war songs and we have to flee,” Musa said. The state Police Public Relations Officer (PPRO), Joseph Kwaji, confirmed the incident, saying soldiers and a detachment of police officers from the state command and other neighbouring divisions were promptly deployed in the town. He said law and order had been restored in the affected areas after the crisis sparked off by the verdict of tribunal. Kwaji confirmed to the News Agency of Nigeria (NAN) in Jalingo, on Sunday, that the crisis broke out in the early hours of Sunday. He said that though the police had not concluded their investigations, the crisis might not be unconnected with the ruling of the tribunal. “Yes there was crisis in Wukari, but it is under control now. Security men have been deployed in the area and normalcy has returned to the town. “Investigation is ongoing but it is likely that the crisis is in connection with the verdict of the governorship election petition tribunal of Saturday,” he said. The command’s image maker, who said that figures of casualty had not been ascertained by the police, warned the people not to take the laws into their hands. He said that the state Commissioner of Police, Mr Shaba Alkali, had moved to the area to ensure that peace was restored. He warned that the command would come hard on any one bent on fomenting trouble in any part of the state over the verdict of the tribunal under any guise.